Stick a hose down the side of the buckets and let water flow between them. 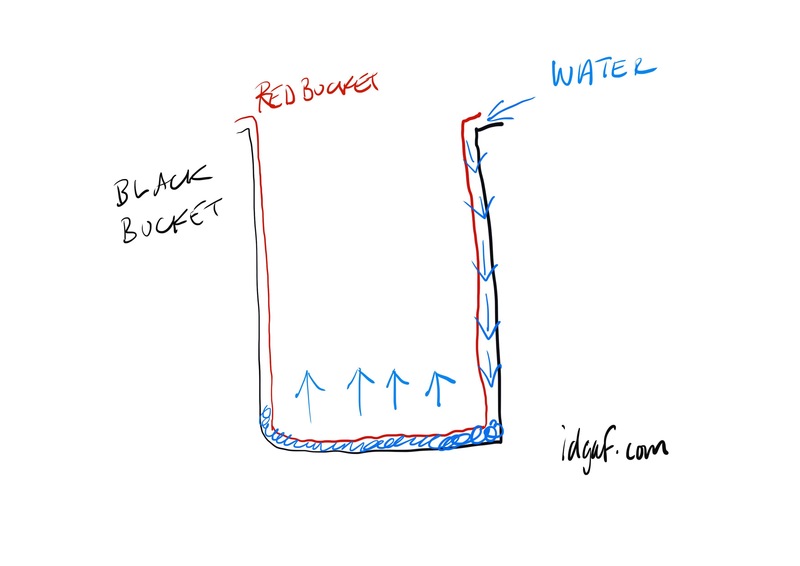 The gap between the bottom of the buckets will fill. The water pressure will unstick them. I’ve had two buckets stuck together for months. To make it worse, there was dried mud between them and they were ridged, and the ridges were pushing against each other. I tried everything. Prizing them apart, bending them and trying to hold one down with my feet while pulling on the other. The videos I found suggested using a compressed air line from a garage, but I didn’t have that. One day I realise that it didn’t matter what was providing the pressure to push. Water would work. I first stuck the hose as far down as it would go and cranked the tap. The water spurted backwards and started flowing out, faster than it was pushing up. When I let the water flow more smoothly and slowly, the gap between the buckets filled and they pushed themselves apart. This entry was posted in Uncategorized and tagged compressed air, separate buckets, stuck bucket, unstick buckets, water on 07/07/2017 by Idgaf.